This weekend marked the debut of Guilds of Ravnica Standard at the Grand Prix stage. Earlier this morning, 1339 main event competitors arrived in Lille with their best Standard decks. After eight rounds of Swiss, 277 players made the cut for Day 2, including 11 players at a pristine 8-0 record. The most popular choice among three-bye players was Golgari Midrange, by a lot. Below, you can find the full metagame breakdown of all 23 players who got three byes, either as a Gold or Platinum member of the Pro Players Club or as a Pro Tour Hall of Famer. Golgari Midrange was the deck that the majority of these pros put their confidence in. It was also the most popular choice among Trial Winners. With a high density of good cards, versatile answers, a consistent mana base, card-advantage generating creatures, and powerful late-game threats, the archetype has the right tools to tussle with everything. According to World Champion Javier Dominguez, the deck's popularity is largely a factor of it being easy and obvious to build while being very consistent at the same time: "It is the Deck to Beat because it's probably the most consistent one. All the explore creatures make it so that it basically floods less and screws less than every other deck. You get to play more games; all other decks have more non-games." That all makes sense, but how do we beat the deck? Well, one approach is to tune Golgari Midrange for the mirror match. This largely comes down adding more Carnage Tyrant. The 7/6 dodges all spot removal, has enough toughness to survive Find // Finality, and pressures opposing planeswalkers. All the 3-bye pros on Golgari Midrange ran multiple copies of the humongous Dinosaur, and some of them even added Druid of the Cowl or Elvish Rejuvenator to ramp into it more quickly. But what if you don't want to play Golgari Midrange mirrors? Judging by the 3-bye metagame breakdown, the plan of countering their big spells and then going over the top with Chemister's Insight, Teferi, Hero of Dominaria, and Expansion // Explosion is a valid one, even if Jeskai Control is vulnerable to Carnage Tyrant too. But there are many other weaknesses of Golgari Midrange that can be exploited by various cards in various strategies. Arclight Phoenix exploits the fact that Golgari Midrange has little to no graveyard hate. In an Izzet shell filled with spells like Chart a Course, it keeps recurring, and multiple Golgari Midrange players told me today that Izzet Phoenix was their worst matchup. Moreover, the typical Golgari Midrange creatures lack flying or reach, which means that they have no way to stop Arclight Phoenix in combat. Tempest Djinn and other fliers are well-positioned for the same reason, especially when you can efficiently shield them from removal spells with Dive Down. Tocatli Honor Guard, a popular inclusion in Boros Angels, reduces the entire Golgari creature base to a bunch of overcosted vanillas. After all, Merfolk Branchwalker, Jadelight Ranger, Seekers' Squire, Golgari Findbroker, and Plaguecrafter aren't good because of their raw stats—it's all about their enters-the-battlefield abilities. To make matters worse, Golgari Midrange players have a hard time answering Tocatli Honor Guard, as Ravenous Chupacabra is shut down as well. Finally, The Immortal Sun is a powerful value engine that is hard to answer for Golgari players. Usually, they would rely on Vivien Reid or Vraska, Relic Seeker to destroy enchantments or artifacts, but the planeswalkers can't even be activated when The Immortal Sun hits the battlefield. Adding it all up, there are plenty of ways to beat Golgari Midrange. And given that only two of the eleven 8-0 undefeated players were running Golgari Midrange, the early indication is that the players who came prepared to beat it were successful. A lot of awesome games were shown on the twitch.tv/magic channel today. But five moments stood out. In Round 1, Niv-Mizzet, Parun turned on its owner. Fabrice Manant took the traitorous Dragon from the top of his opponent's deck with Thief of Sanity, prompting an immediate concession. In Round 2, Antoine Cinquin was allowed to untap with Experimental Frenzy, and the top of his deck delivered with not one, not two, but three Runaway Steam-Kins. He was only 0.03% to chain together that many, so it was a successful experiment indeed. In Round 4, World Champion Javier Dominguez showed why Carnage Tyrant is so pivotal in the Golgari Midrange mirror: It's not just good against an opposing Find // Finality—it's even better with your own. In Round 5, Grzegorz Kowalski won the deciding game in spectacular fashion. It started with a March of the Multitudes that triggered Path of Discovery six times and ended with a horde of 6/6 tokens (thanks to Path of Discovery, The Immortal Sun, Trostani Discordant, and Flower // Flourish). But the part I clipped was the sextuple block in between—a play that wasn't obvious to everyone, but Kowalski made the finals of the 2018 World Championship for a reason. In Round 7, Hall of Famer Guillaume Wafo-Tapa was very nearly dead, at a risk of dying to Banefire on the next turn. But he turned it all around by gaining an astonishing 16 life with Deafening Clarion. Even the subsequent pings from Niv-Mizzet, Parun gained him extra points of life. At the age of 14, Javier Dominguez was taught the game by his cousin Pedro at a family reunion, after which they started going to a local game store together. 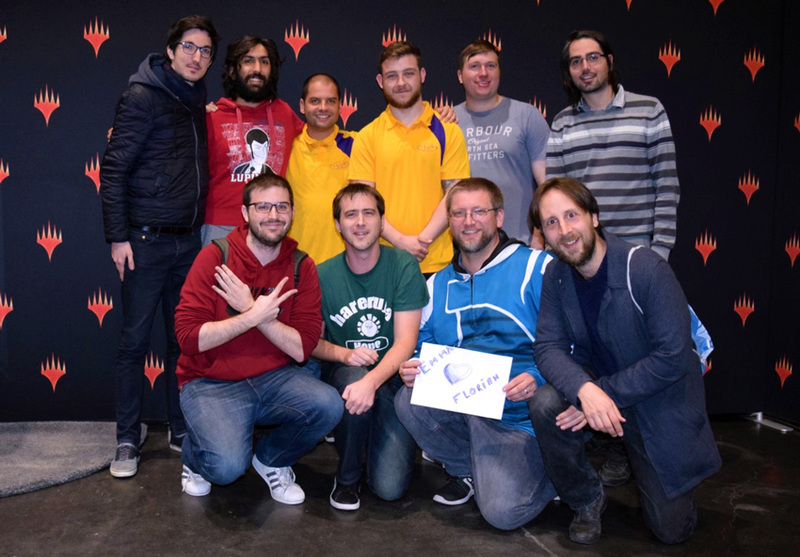 But none of Javier's family members could have expected that 17 years later, they would be sending him congratulatory messages as the 2018 Magic: the Gathering World Champion. "All of my family was rooting for me, and I was feeling all the support from everyone," Dominguez said. "I think that's probably one of the sweetest things—this feeling of how people support you. Some of them even came to the airport to see me. For me, it was almost as special; all of them being together, receiving me—it was super cool." 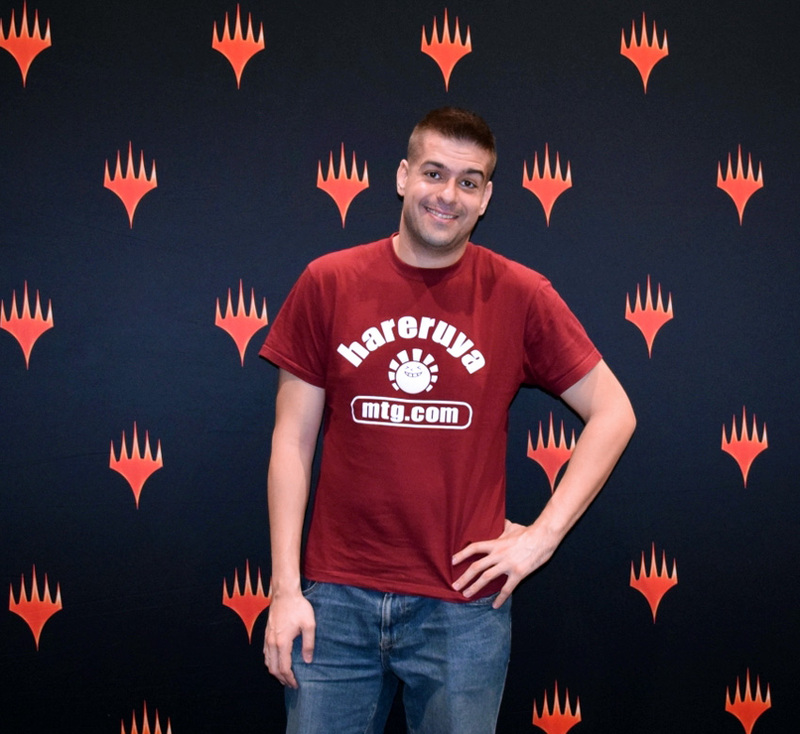 His path from local player to World Champion is detailed in Eric Moyer's article on ChannelFireball, but the quick summary is that a young Dominguez strung together several Pro Tour qualifications, then stopped playing competitive Magic for nearly a decade, but eventually rediscovered his passion when a Pro Tour was held in Spain, his home country. He dedicated himself to serious preparation, earned a reputation for solid technical play, and soon earned a qualification for another Pro Tour. His continuous dedication paid off with two 9th place Pro Tour finishes, a Top 8 at Pro Tour Ixalan, a finals appearance at the 2017 World Championship, and finally a victory at the 2018 World Championship. As Grand Prix Lille marked his first premier event since receiving that trophy, I asked Dominguez how it feels to arrive here as the World Champion. "I don't think of it that much in those terms," he answered. "It obviously feels good, and when I look back at it, it makes me smile. But in Magic, it doesn't matter who you are—you are just playing the game, and being someone doesn't make you more likely to win. The cards are still going to do the same. The title is obviously awesome, but it's still just a tournament." For the 2018-2019 season, Dominguez has teamed up with Grzegorz Kowalski, Kelvin Chew, Jérémy Dezani, Andrea Mengucci, and Lee Shi Tian to form Hareruya Sword for the Team Series. "Tomoharu Saito helped us get together as a team, and everyone was very happy with the configuration," Dominguez said. "All six players are really good, and I think this team could win the Team Series." Given that it includes the World Champion and the runner-up, along with three additional Platinum pros and a Hall of Famer, it's hard to argue with that. Although Dominguez is a full-time competitive Magic player, he also enjoys playing games more casually. For example, he enjoys an occasional Commander match. His favorite commander is Leovold, Emissary of Trest: "I just love Sultai. I like to play it more like a good stuff deck, more or less like the Legacy Leovold deck." He also enjoys old-school RPGs—Chrono Trigger from the SNES is his favorite—because he likes the learning and problem solving process from those games. But recently, the World Champion has been playing a lot of Magic Arena. "I'm loving Magic Arena. I didn't think I would like it—I kinda thought I wasn't the target of the program—but I tried it and found it was really cool. I think I prepared the most for this GP by playing on Magic Arena. I just played a lot of Arena these two weeks. The games are fast, and there's something that keeps me wanting to play. It feels like I'm playing a video game but at the same time I'm also playing Magic. So Arena lets me to prepare for a tournament and have a video game experience." His Magic Arena preparation worked out well, as Dominguez ended the day with a 7-1 record—a good start to the season. Eleven players reached the end of Day 1 with undefeated 8-0 records. Congratulations to Florian Trotte, Renato Spinelli, Francesco Giorgio, Rob Catton, Harry Garbett, Michael Blanc (back row left to right), Carlos Moral, Peter Vieren, Thomas Diedic, Alexandre Darras (front), and Thomas Angel (not pictured)! Day One's undefeated decks are: 4x Jeskai Control, 3x Izzet Phoenix, 2x Golgari Midrange, 1x Esper Control, 1x Mono Blue Tempo. So Golgari Midrange didn't dominate the top tables at the end of the day; it seemed like most players were well-prepared for the archetype. All 8-0 decklists will be posted in a separate Day 2 coverage article at the start of Round 15. Check back tomorrow as we continue to bring the live action from Lille. The twitch.tv/magic stream starts at 9 a.m. local time (i.e., 8 a.m. UTC or 1 a.m. PT). This is taking into account that in France, Daylight Savings time ends tonight, effectively giving all competitors an extra hour of sleep. But no matter your time zone, we'll open with Good Morning Magic to showcase the most interesting Standard decks in Day Two, as always.